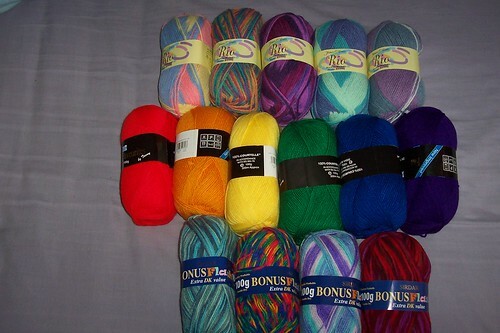 Yummy new yarns! « T-Bird\’s crafty Blog! « have you seen Madeleine? to go with all those sock and mitt patterns…. Top row are “rio” yarns and have a small wool content so are a bit warmer but a little bit prickly until worn in. The rest are all synthetics and reasonably smooth. The colours aren’t quite right on this pic but I can’t be bothered wrestling with Gimp to brighten them so you will have to take my word for it but the last on the middle row is a purple and the last on the bottom row has more red in it than you would think from the picture. Still dithering over patterns and sizes etc, but I’ve got plenty more rubbishy yarns and oddments to play with so I’m not wasting anything good and by the time it’s camp I’ll be all geared up! This entry was written by tbird and posted on 19 May , 2007 at 6:11 pm and filed under to do list. Bookmark the permalink. Follow any comments here with the RSS feed for this post. Post a comment or leave a trackback: Trackback URL. well, SB is about size 12 and i’ll aske her, i fancy fingerless gloves i’m a 6.5 glove [no idea what that means otherwise for size – a medium?] finding it hard to choose though – prob bottom left?? I think me and mine would love camping socks in the 4 colours on the right (so not the first!) on the top and the second to right on the bottom. Blimey, Josie in an 8 already! Helen, your hands are about the same size as mine then (assuming you don’t have your gloves so tight they cut off the circulation! So I’ll do them to fit me and they should be fine for you. And I can do stripes with the plain colours just to further spoil you for choice…..
ooh, now very tempted! i think i might fancy the red one on the bottom right now, perhaps -having said something different on the other blog, and if there was enough for matching socks…! varigated purple or just plain purple for SB? Okay, silly question, the variated one I’d guess?